To remove SalesHandy plugin from Chrome. How to enable blocked notification? 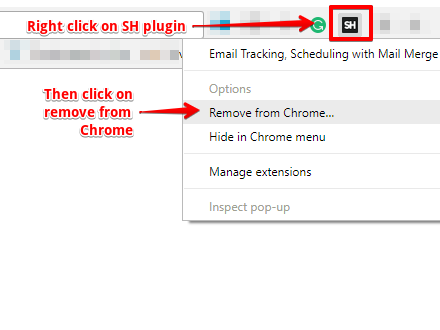 What should I do if the Chrome extension is not working? How to check SalesHandy chrome extension version? Step-1: Go to Browser toolbar. Step-2: Right-click on SalesHandy extension. Step-3: Click on remove from Chrome. To Remove SalesHandy Outlook plugin from windows. Step-1: Go to Control panel of your PC. Step-2: Control Panel > Programs > Programs and Features. Step-3: Navigate to "**SalesHandy**" and click on it. Step-4: You will be asked "Are you sure you want to uninstall the SalesHandy?" Click "**Yes**" to uninstall the SalesHandy plugin.